He was born in Chicago. Educated in England. Enlisted with a Canadian unit during the Great War. But his prose defined Los Angeles for generations who never lived to see the Brown Derby and have never crossed the Atlantic Ocean. A fish out of water always, erstwhile and earnest poet, oil country executive, disappointed man. He only turned back to writing when the Depression and alcoholism eliminated everything else. The Big Sleep, his first novel, wasn’t published until he was fifty years old. His wife was sixty-eight. When we talk about Raymond Chandler, we get personal. His writing—and his unparalleled creation of an imaginary Los Angeles that has superseded and outshone every film attempt to capture it—an irony he would’ve enjoyed—reaches deep. Not just because of his literary style, not just because of a penchant for nostalgia. But because he created a world we dimly recognize, idealized in the form of an idealized man, but dirty enough to be familiar. If Hammett was the father of detective fiction, then the more sensitive and sexually ambivalent Chandler could qualify as its mother. Hammett gave us the form… Chandler gave us the soul. He also gave us one of the most pervasive studies of American landscape ever written. His Los Angeles continues to haunt the dreams of writers, readers, filmmakers, all who hunger for that strange mixture of the beautiful and the sordid, a lush desert paradise filled with sooty oil wells and the rust of corruption. Witness… an industry. Websites, a bus tour. 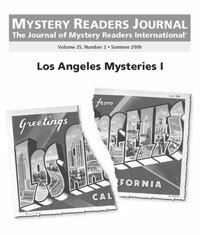 Raymond Chandler’s Los Angeles, complete with photos. The more recent biography of Chandler that is more personal introspection, Judith Freeman’s The Long Embrace. She was referring to Chandler’s wife Cissy with that title, but it is, in a sense, even more appropriate for Los Angeles, the city he loved, hated and helped to create. Chandler was as peripatetic as the Greek philosophers, who gave origin to the word and whom he read as a Classics scholar in England. Never lingering long in one house, he and Cissy changed addresses more than two dozen times. Chandler scholarship is serious: this is truly the stuff that dreams are made of. Fans comb Los Angeles directories and critical biographies, trying to pull a definitive time line of Chandler’s movements throughout his life in Southern California. Why he moved around so much is a question much asked. I like to think it was a restlessness that echoed the environment. Los Angeles, more then than now, possesses a sense of the vast. Hills dotted with oil wells and Pickfairs, valleys with orange groves, the endless potential of the Pacific Ocean right there off the Santa Monica Pier. He was an ant on a flat desert valley, a strange desert where everything and anything could grow. Why not move around? This sense of rootlessness was not as strange in pre-1950s superpower America, where men typically moved to find work, a scarce commodity in the Depression. Several great migrations occurred during the early twentieth century, brought about by War and economic and social instability, and the idea that you had to settle down with a white picket fence and a smoking jacket was not yet fully programmed into the American psyche. Restless or not, Chandler knew the city. And despite protestations in the mouth of Marlowe, he wanted to live there. Marlowe himself is from Santa Rosa, the perfect idyll of the American small town. Chandler used it as such long before Hitchcock did, in Shadow of a Doubt. Marlowe is the small-town boy made cynical by big-city corruption. On one level. If you read Chandler’s The Little Sister, you’ll see a portrait of small-town venality that makes Los Angeles look like Disneyland. Chandler’s Los Angeles is a City of Fallen Angels. From the oversexed movie queens of The Little Sister, to the old rich of The Big Sleep and The High Window, to the spiritualists and shysters of Farewell, My Lovely, his descriptions haunt, linger, creating a Los Angeles at once hyper-real and complete fantasy. From downtown Los Angeles and 615 Cahuenga Boulevard where Marlowe had his office, to Cedar Lake in the San Bernadino National Forest where The Lady in the Lake was set—to his most famous creation, Bay City/ Santa Monica… Chandler continuously juxtaposes the beauty of bright, blooming bougainvillea, creaming ocean waves and the ugliness of the human condition. And perhaps… perhaps this tension is a reason for his fascination with Los Angeles. Unnatural crimes in a natural paradise. A land of make-believe, populated by script-writing alcoholics and the doctors who saved them for one more round at Musso’s. A vast desert where anything could grow—with water. A giant, sprawling map of roads and boulevards, energy dissipated between highways and canyons, only to be picked up again in front of the latest premiere or an alley off the pier in Bay City. Chandler saw it all, wrote about it all. And when he finally did move out of Los Angeles with Cissy, fled to a nice house in the nice town of La Jolla, he was, from most accounts, miserable. No tension. No balance. Peace and quiet and a beloved wife, too ill to move around anymore. Yes, he wrote The Long Goodbye when he was living in La Jolla. And he was still sharp enough, despite the alcoholism, despite Cissy’s decline, to recall Los Angeles in all its temptations and grotesqueness, watching the city dance a masque for the Red Death in a lush valley of fruit. In a sense, the novel is a goodbye to Cissy, who was dying, and a goodbye to a city that he created as much as anyone. His last and subsequent novel, Playback, demonstrates the outward style Chandler is famous for, but none of the soul. I yearn for the Los Angeles he created. I pay homage to it as a writer. It’s a land of never was and yet always-will-be. It’s a desert filled with angels, an ocean of silver-wigged saloon singers who aren’t bad girls, of gentlemen gamblers and cowboy DAs and writers who drink too much. Raymond Chandler’s Los Angeles lives forever. And that’s all any writer can ask. Kelli Stanley‘s next novel is City of Dragons, coming February 2010 from Thomas Dunne/Minotaur. Set in 1940 San Francisco, it owes much to Chandler’s Los Angeles. Kelli is also the proud owner of a genuine Chandler artifact: a copy of the works of Henry James, given to him by John Houseman after he finished the screenplay of The Blue Dahlia. The address stamp reads: Raymond Chandler, 6520 Drexel Ave. Los Angeles. It’s got a pulse to it. A heartbeat. Not any of the bodies LAPD detective Lena Gamble finds in my new crime novel, The Lost Witness (St. Martin’s Minotaur, Feb. 2009). Instead, I’m thinking about the City of Angels. There’s a kick to the place. A certain vibe. Something I could feel the moment I moved here. And I love it. The traffic, the smog. The summer heat that burns so dry it sends chills up your spine. The high-profile trials and the media circus that goes with them. That guy from Beverly Hills who blew snow all over his house so his kids could have a white Christmas in the hot sun. I love the insanity. The whole package. The way none of the pieces to this real-life puzzle were ever made to fit. The Lost Witness is set in this world, and it’s a story about a young woman with a horrific problem. She needs help from the system and she’s not going to get it. Instead, it’s murder—the big fall—and she winds up in the trash behind a dive bar in Hollywood. Enter Homicide Special detective Lena Gamble from the LAPD. This is Gamble’s first case since City of Fire, and the cards aren’t just stacked against her from the first page. There aren’t any cards. The victim has no identification. There are no apparent witnesses. Not a single clue. And just to dial up more trouble—Lena has been warned by her supervisor that she’s probably walking into a trap designed by LAPD brass to get rid of her. Getting rid of Lena Gamble can mean a lot of things. To some, a transfer to a desk job in San Pedro might fit the bill. But probably not this time. Not this book. Not this writer. Getting rid of Lena Gamble means that they want to get rid of her. And they want it bad. The Lost Witness… I love this novel—it runs white-hot. And I love the city this story is set in. I have friends who claim that they can feel the edge living in New York City. I believe them. The two cities share many of the same themes. People coming from another place, another culture or even time, chasing their hopes and dreams. Beating the streets. Winning and losing and holding on for the ride. Maybe it comes down to where you came from. Where the race began and what you brought with you. And just maybe it’s also about how frail both cities are in this world we find ourselves in. The world we call today. I’m sitting in a café just north of the Sepulveda Pass. The sun set a half hour ago, and I can see the Santa Monica Mountains slumbering in the darkness. The white headlights and red brake lights from all the cars moving up and down the 405. There are so many cars that their lights congeal and look like a lava flow streaming down the mountain side. Electric lava. Gas driven lava. The sight inspires awe. It’s beautiful, yet horrific. The sheer number of people feeding through the pass. A line that appears endless. As long as you don’t have to be anywhere, L.A. is a great place to live. My cell phone rings. It’s Rick Jackson. While I’m waiting on the traffic, he’s at an airport on the east coast heading for New Orleans. Rick is a veteran homicide detective—one of the very best—working out of the cold case unit here in L.A. He’s been on the hunt all year, punching out air miles, closing in on a murder suspect who’s running out of time. Tonight Rick’s calling with news. Not about the case, but about Detective Lena Gamble. He has her phone number, and he won’t let anyone else have it. We laugh. It’s become a joke since The Lost Witness book tour. The first thing readers said from one bookstore to the next. Women want to be Lena, guys want her phone number. We laugh again because it’s a joke. Or is it? Most people can think back and spot the moments in their life when they changed direction and started on a new course. For me, one of those early moments came as a student when I managed the kitchen at a nightclub called The Main Point in Bryn Mawr. That’s where many of the first cracks began to appear in the status quo world I was born in. That’s where I met Muddy Waters and Larry Coryell. Spent a little time with Chick Corea and Al DiMeola. And that’s why Lena Gamble listens to music in my novels. Why her brother played guitar. I played music, but was much better at listening. Along the way, I met a character or two. But this is also how I relate to plot in my thrillers. The Lost Witness book tour opened with starred reviews from Publishers Weekly and Booklist. The gist of the reviews mirrored the wonderful reviews Gamble’s first murder case in City of Fire (St. Martin’s Minotaur, 2007) received. They talk about plotting and character and doing both at the same time. They talk about the way my stories move. My crime novels work like roller coasters, making the climb up that first big hill with Lena Gamble and Stan Rhodes in the driver’s seat. As the detectives put the murder case together, we gain confidence and think that we have a handle on the story. And then something wonderful happens. We plunge down the hill and take the shock that nothing is what it appears to be. The Lost Witness works like a controlled crash, filled with one pop after the next and a big finish that seems to make everyone smile as much as I did. And the way I do it is with character. I put people together. A wide variety of people who are often times outrageous. Once I have a handle on their hopes and dreams, I let go and let the story ride. Let it crash and explode. I can’t be sure, but I think this comes from the people I’ve met who don’t really fit anywhere other than where they are. That crime novels are less about action and more about what characters discover—the more discovery, the faster the thing goes. I take another hit of coffee and gaze out the window. That stream of lava flowing down the 405 really is endless. I remember reading somewhere that more than a quarter-million cars drive through the pass every single day. Tonight it looks like they all came out at the same time. It looks like a party. Getting home will be a grind. While I wait it out my thoughts return to Lena Gamble working her next case somewhere in Los Angeles. Some of the characters who surrounded her in The Lost Witness. Vinny Bing the Cadillac King, who sells cars, hosts a TV show on cable, but deals with people like the grifter that he is. Nathan G. Cava, a professional hit man who isn’t exactly a professional, and lights up every chapter he’s in. And then there’s Stan Rhodes, a homicide detective who works with Gamble, keeps things grounded and has become her trusted friend. Could any of these characters live anywhere else? I don’t think so. They’ve got it their blood. The wildfires and the earthquakes. The searing heat and torrential rains. That feeling that a big score is just over the next hill. That the void is closer than you think. That survival here means learning how to scramble and do the dance. That anything can happen here and often does. In the end I think it’s about a city and a character who is a metaphor for that city. In the end I think it’s about the human spirit. This is Homicide Special Detective Lena Gamble, and she lives and works in the city of Los Angeles. Robert Ellis is the bestselling author of the critically acclaimed crime novels City of Fire and The Lost Witness. Some of my growing years were spent living in Raymond Chandler’s Bay City. I lived in an old hotel on the boardwalk at 1910 Ocean Front Walk in Santa Monica. The structure—and it’s a mighty one—was built as a luxury hotel in the late 1920s, during Prohibition. But it was built before the crash of 1929, so make that large-L “Luxury.” It was designed to be a pretty tony place, and it was. In the late 1960s and early 1970s when I was there the hotel had fallen on hard times—albeit hard times with a killer view—but it wasn’t difficult to imagine what it had been. The building was beautifully proportioned and appointed, in a way that only times of extreme excess can create. Marble this and mosaic that, and ballrooms and even a room beneath the earth that was called, simply, “the rotunda,” that when you walked through to the other side, you’d passed under the boardwalk and were standing on the beach. The room was round, though, so the name fit well enough. As I write this, I can hear childish voices echoing off the rounded walls; hear the slap, slap, slap of a dozen small bare feet as we headed out, pulled by the sun. Would adventure lie in that direction? It might, you know. It very well might. The ghosts of youth melting into the ghosts of an era long gone. A splendid memory, somehow. One to build upon. And I guess I have. Because the hotel was built during Prohibition, there would have been illegal goings on there at the time of its construction and earliest use. I did not know that when I lived there. Not for sure. I know that now. The time of the building’s design and construction was a hairy, lawless time in L.A.’s history. The city was not without law, of course. But the police of the time were famously corrupt and certainly, in the moment in which I’ve chosen to set the Kitty Pangborn stories, it would often have been difficult to tell the good guys from the not-so-bad. But the hotel. My childhood. The echoes of high voices and sand-covered feet. We knew that rumrunners and gangsters had been taken into consideration during the design of the building. We knew this because, well, because adults said so. But also there were tunnels that ran behind walls and connected floor to floor. Not everywhere, of course, no. But in enough places that the group of us who were children together in this period made it our business to devote as much available time as possible to discovering all the hidden corridors and where they began and where they ended up. It was an activity that could have engaged us endlessly, I suspect. There would be weeks and months where we’d discover nothing at all and then—lo!—we’d gain access to an area where we had previously not been given passage and something would turn up. I remember spending a lot of time tapping on walls and imagining. It seems to me that, in a way, I still do. We spent time considering what purpose the various hidey-holes we found might have served. We came to conclusions—most of them probably wrong. But it was entertaining to give consideration to these things: to think about what might have been happening beyond the rosewood paneling; to think about what dramas might have played out in these very rooms, all those years before. Other images from that time—and connected to that place—have left strong impressions. The demise of Pacific Ocean Park (though we always referred to it as Pee-Oh-Pee). Playing under it and the Santa Monica pier with my friends. (Can you imagine anyone letting their kids do a thing like that now? Unsupervised?) Muscle Beach and the boardwalk in the 1960s and early 1970s, while those things were more shoddy than they had been; less posh than they would become. There was a park next to the building and just above the boardwalk and we spent countless hours there, the park’s hilly edges becoming cliffs and mountains in our minds. We called it Cactus Park, but it’s actually called Crescent Bay Park. I don’t know if I’ve remembered it wrong or if the name has since been changed but we had strict instructions not to touch any needles we might find in the park or talk to anyone whose sleep we might disturb. There were occasional expeditions to the mall, which was what the Promenade was then called and before the actual mall—Santa Monica Place—was built. That was in the time that the mall-that-would-become the Third Street Promenade was new and hopeful. Before it got grotty. Before it got hopeful again. L.A. has always been a city of change and rebirth. These odd things I remember fondly: running along the beach careful to avoid patches of oil from early coastal spills, as well as the jellyfish that had died because of those oil spills. I don’t know if stepping on a jellyfish would actually hurt you. I doubt it. But it seemed to us a potential fate worse than death. Grunion runs: silvery buckets of them right outside our front door. The river: oh! The magic of the L.A. River where it headed into the sea! We spent hours playing at that lip. Though it could not have been the river, just our own little neighborhood tributary of it, I shudder to think of that now. Playing there. Unpleasant things sometimes floated past us towards the sea. We’d close our eyes. When I sat down to write the first Kitty Pangborn novel, none of this was on my mind. I was not thinking about my childhood. I was not thinking about secret hallways and hidden rooms and concrete rivers. But I suspect some of that stuff colored my psyche, in any case. How could it not? We’re impressionable when we’re children, and make no mistake: some of what we build then, we’re building for ourselves. We end up dragging it around. Did I dream the first Kitty Pangborn mystery there, with those old-school L.A. gangsters—gangsters in spats—haunting the hallways? It’s possible I did, though if so, I have no recollection of it. Here’s what I do know: you cannot live that sort of life without having it touch you somehow. You can not immerse yourself in the culture of those who have been reduced to ghosts without having it color your own reality. Every time I sit down with Kitty and drink heavily of her world the time I spent—that childhood time—running wildly through the corridors of that hotel haunt me. They make it real. Or all more real. And then I try to share that reality—that surreal reality—with you. Linda L. Richards is the editor of January Magazine, a regular contributor to The Rap Sheet and the author of the Kitty Pangborn mysteries, Death Was the Other Woman (2008) and Death Was in the Picture (Jan. 2009), both published by St. Martin’s Minotaur/ Thomas Dunne Books. She lives near Vancouver, Canada with her partner, the artist David Middleton.